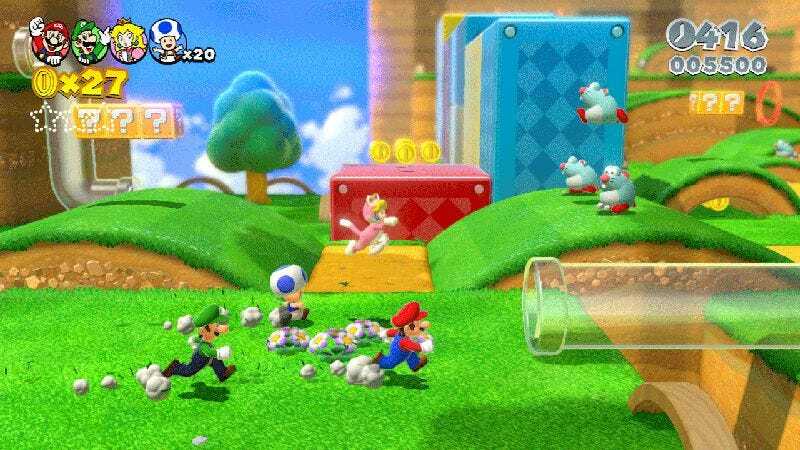 Super Mario 3D World’s 1-1 starts you off on an area that pretty much demands you move in only one direction, which (assuming you’re pressing the run button) will show you that you speed up by running for long enough. There are multiple cat bells to find and a bunch of points that help you figure out how to use the Cat Suit’s wall climb. There are coins up in places that you can only reach with the wall climb, coaxing you to use it. Later, there’s a slope with paw-prints, which spells it out for you if you’ve yet to get it. If you run to that slope as a cat, you’ll just keep climbing. Then there are the clear pipes. The first one has coins going through, enticing you to go in there. The next one is a shortcut up a hill. Then, comes the one with a Green Star, and you’ll have to learn to change directions mid-tube if you want to get it. All the while, there are other details—tons of pits that are non-lethal; the second half of the level being more open and showing you a sweeping shot of it as you go through the pipe; the rabbit running away from you as opposed to the goombas charging to show, outside of their basic design, which is enemy and which you want to catch—so much stuff. And then the level even has tricks and gimmicks that you can master once you’ve learned the basics. The video I linked to shows the player getting the third green star without the Mega Mushroom, for example, and you can also cat dive from the first half of the level to the second without using the pipe, which saves time. I’m finding that the flood of games on Kickstarter is starting to sap my confidence in the process. It started as a platform for otherwise ignored designers to get their work out there. Then, it became a place for weaker companies to test the waters with (typically nostalgic relaunches of) risky designs. Now, it’s almost the go-to for even the most well known names in board games. I guess what I’m worried about is that we’re seeing a lot of the same old stuff—copycat designs, slight changes on existing mechanics, and not a lot of innovation. Note to self: Look at the year of release of BoardGameGeek’s top 100 and see if there’s a trend. It sounds similar to the way Kickstarter developed for video games. There were smaller projects that fit the description of “otherwise ignored designers”—Kentucky Route Zero comes to mind—before what could be considered the Big Bang with the Double Fine Adventure, and now we have 1000 nostalgia-fueled rehashes and Sony using Kickstarter as an advertising platform. That’s only on the surface, though. It has become more difficult for smaller projects to be seen, but take this month alone. We saw the instant success of the A House Of Many Doors campaign and will see the upcoming release of extremely weird, charming RPG-of-sorts UnderTale. For all the cynicism the platform inspires, the system still works. Between all the “same old stuff, copycat designs, slight changes on existing mechanics, and not a lot of innovation,” there actually are projects that do deliver on the promise people saw in Kickstarter back in the day. You just have to adjust your filters accordingly. Hoax reminds me of a pseudo-role-playing game my brother had once, based on the Baron Munchausen stories. One player would ask another about an outlandish escapade (“Tell us, Lord Semple, about the time you were forced to fight a duel against yourself to the death, and how that resulted?”), and then they had to spin a long yarn off the top of their head about what happened. Other players could challenge your account at any point, making small wagers that some detail was a lie, and you had to justify what you were saying or lose the wager. The best bit was that the rule book was written in Munchausen’s voice and is vastly entertaining. One of the things that’s been the most interesting about seeing this game’s evolution is how it went from “somewhat wacky ROM hack” to some sort of interactive lesson on game design—albeit with the zany stuff taken to even weirder extremes. The types of materials aren’t infinite but can be used in different ways, encouraging experimentation in what you add to levels. The pre-existing levels, at least in theory, can help present the different ways in which levels can be built, and it presents materials slowly and steadily to make you think more about how they’re used together. It’s a really neat way for a level editing tool to work, and I’ve been really happy with what I’ve seen. Something like this is vastly more interesting to me than a new Zelda or Star Fox game, and I’m glad something so quirky, even if it is super easy to advertise, is getting that kind of attention. It really seems like this idea had been gestating since Nintendo’s Excitebike. Remember how the level editor felt in that game? It was like you were accessing something you weren’t supposed to. There was no score and no sort of tutorial—you were just thrown in. I remember just putting tons of jumps in a row and winding up with an unplayable level but still having such a weirdly fun time. I’m glad Nintendo finally made good on the concept it introduced decades ago, and I really really can’t wait to get my hands on this game. And speaking of Mario Maker, several commenters (and Derrick) suggested all you Miyamotos in training pool together and create some sort of Gameological level repository. Well, feel free to fill up the comments here with those level codes, or maybe whoever created that listing of Gameological 3DS friend codes (I’m so so sorry for forgetting who it was) could create a similar page? Either way, I look forward to trying out your Mario masterpieces! That does it for this week, Gameologians. As always, thank you for reading and commenting. We’re going to be doing something a little different next week. It’ll be fun. I promise. Stay tuned!